I know it's been a while and I'm sorry. I really hope you can all forgive me. 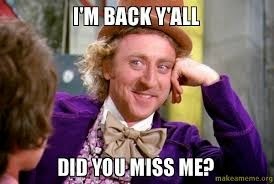 But no worries, I'm back, and dare I say it, better than ever! Okay. I'm back. Probably not better than ever. Probably pretty mediocre as per usual. But enough about me. I have some good news! Although I'm the same old gal I always was (seriously enough about me), our Team of the Week is nice and fresh (if 3 weeks old is fresh...)! Why is Promise Clinic important to you? Taleen MacArthur (M1)- "Promise Clinic is important to me because it gives me the opportunity to give back to individuals in RWJ's local community in a meaningful way. Even though I have limited first year skills, Promise Clinic allows me to make a difference in someone's health using what little I do know." Andrew Butler (M2)- "Promise Clinic is important to me for two reasons. First, it serves a great need in the community and gives access to care those who need it and otherwise would go without it. Second, it gives us as students great opportunities to learn and build actual rapport with our patients. Particularly in years 1 and 2 of medical school, our interactions with patients are somewhat artificial or superficial; Promise Clinic allows us to establish a relationship with a patient and create a dialog that helps improve the patients health." Do you prefer dogs or cats and why? Taleen (M1)- "Dogs. Why wouldn't I want a pet that's always happy to see me?" I hope you all enjoyed learning a little more about Team 4! I know I did. Thank you Team 4 for being so dedicated to your new patient.